We have summarized the best birding binoculars into price categories: Economy, Mid, Top-Affordable and Best of the Best. If you can afford a little extra, the mid-price range bird watching binoculars - the Nikon Monarch's - are your best bet considering performance, quality and price. The 7x35 Nikon Action Extremes were the best quality binoculars in the economy group. Rubber Armoring/Non-Slip Grip and Shockproof for those of us who occasionally bang or drop our bins when we get excited seeing a new bird! 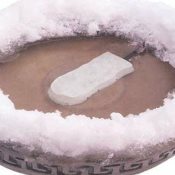 Low-priced - Now under $150! "I bought these binoculars because they were the top rated ones on the moderate priced list by a very influential ornithology organization. You could spend a lot more to get the same quality binoculars in a smaller size, but you probably wouldn't get better quality binoculars. Can't beat this one for the price and quality. Well reviewed and a best seller at most binocular retail stores. 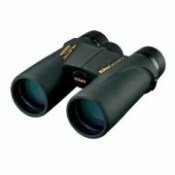 You can read more about the different sizes and reviews here at our Nikon Action Binoculars page. One downside is these are porro prism binoculars that do weigh more than roof prism binoculars and are a little bulkier. Check out the Monarchs below in the mid-price range if you want a more stream-lined set of birding binoculars with less weight. The 8x42 Nikon Monarchs actually came in second place to the Katmai 6x32 in the mid-price class, but Cornell advised that the Monarch's are actually better binoculars for bird watching, the Katmai better for butterfly watching. 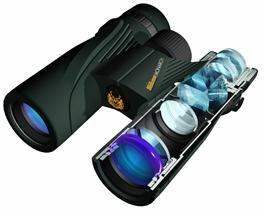 Has features of other more expensive brand binoculars (Leupold, Bushnell, Steiner, etc.) priced over $500 - The Monarchs are under $300, best binoculars to for price if you don't want to spend over $1,000. "Most popular binocs (Monarchs) under $1,000 in my birding groups. Now I see why. Clear, light, bright, great close and far, waterproof. Birds and bugs clear with every marking visible. You can even see the veins on leaves. The Monarch's are lightweight, waterproof, and very comfortable. Many of the reviewers thought they were just as good as binoculars 2-3x more in price. Comparison table and review of all Nikon Monarch Binoculars including Monarch 3, Monarch 5, Monarch 7 ATB models and the Nikon Monarch X. There is also our Nikon Monarch 5 ATB 8x42 Binoculars Review. 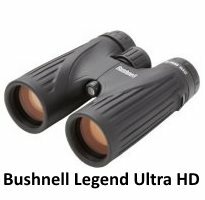 As a close second choice in the mid-price category to the Monarch's, we think the Bushnell Legend Ultra HD Binoculars are one of the best in this category for birding binoculars, especially if you prefer the 10x magnification model. Here is our complete review that includes a comparison table with the Nikon Monarch's. By far the best choice in this category would be the Vortex Vipers. Better than others in this class and the next! "For the money, you are going to have a tough time doing better. 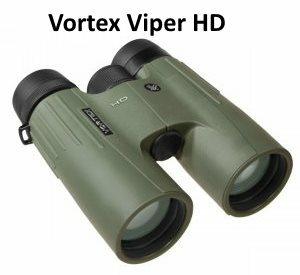 The Vortex HD Vipers come in several sizes, from 8x32 to 15x50. 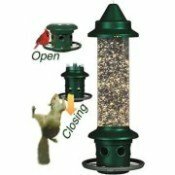 We think either the 8x42 or the 10x50 models would be a great choice for bird watching. If you want a lighter pair, get the 8x, if you want more magnification, get the 10x. The Zeiss Victory 8x42 Binoculars scored the highest in the "Top Gun," best of the best category. It scored the highest for overall quality, producing clear, bright, crisp, near perfect images. 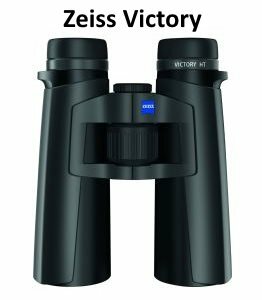 If you can afford it, you can't go wrong with the Zeiss Victory HTs. "I have used binoculars for outdoor pursuits for over 50 years now. I currently own both Leica and Swarovski binoculars in 7 power and they are optically superb products. Long story short, several of (Cornell's) perennial binocular favorites all earned "excellent" ratings, but the binocular that earned top rating, and was ostensibly considered the finest binocular they had ever tested, was the Zeiss 8X42. When I had an opportunity to look through them outside of a local sporting goods store in the rural area where I live, I was immediately taken by their incredible clarity and image quality. But what really drew me to them was the absolutely perfect eye relief distance. They simply got it right and I have never been able to say that about any other brand, regardless of price or prestige. I bought them on the spot and "have never looked back!" In addition to the Zeiss Victory, other honorable mentions include the Swarovski EL and SLC models, Leica Trinovid and Geovid HD, and Nikon EDG binoculars. You may also want to take a look at the Swarovski SLC HD Binoculars Review. Learn how to choose the best binoculars for bird watching. Learn more about binoculars and their features before making a purchase. Learn about the different features of spotting scopes and which are best for birding. For additional information about the ratings, go to Cornell's Picks of the best binoculars for bird watching.